A bond certificate addressed to Jonathan D. Johnson, who purchased $100 Confederate dollars in March 1864. Over three dozen 19th century and early 20th century Presbyterian Church sermons delivered by Robert Zenas Johnston are now digitized and available on DigitalNC. Also included are reports from 19th century Presbyterian Churches, documents from Rufus Johnston, and correspondence from Mary Gibson, both citizens of Mecklenburg County. All of these documents come to DigitalNC courtesy of our partner, Davidson College as part of their Andrew W. Mellon Foundation funded “Justice, Equality, Community: Reimagining Humanities Curricula” project, which is a three-year, campus-wide initiative. All materials digitized for the project by DigitalNC can be found on the exhibit page Nineteenth Century Family Papers and Plantation Records of Davidson College Trustees. 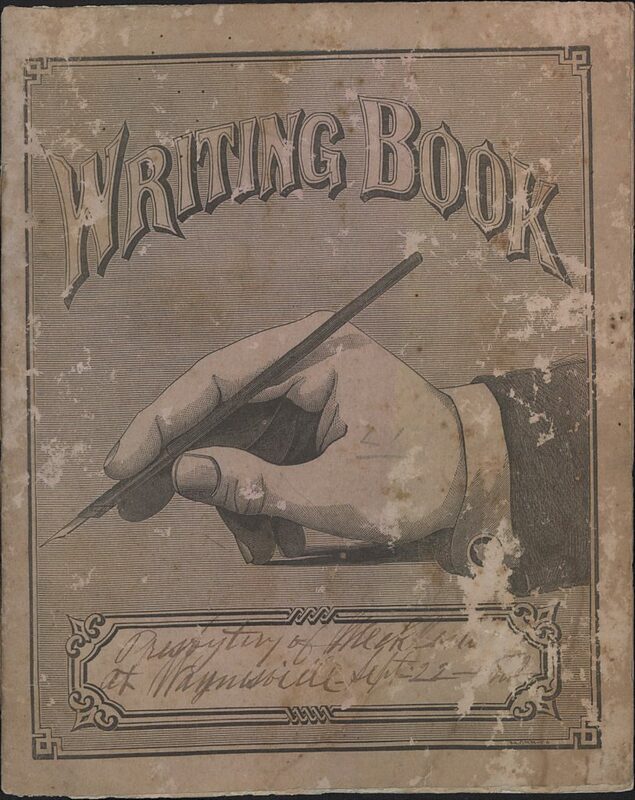 The cover of one of the notebooks used by the Presbyterian Churches of Mecklenburg County, made in roughly 1876. Johnston’s sermons (over 550!) stretch from 1859 to 1907, until just before his death in 1908. He delivered them all across the state, from Asheville to Shelby, in different cities around Mecklenburg County, and even at the Unity Church in South Carolina. Approximately 61 of those sermons are undated, but they most likely date from the 1800s as well. In many of the earlier sermons, he discussed the Civil War on the local towns. We also have several of his student notebooks, a contract for a teaching position and pastoral position that Johnston was offered, and more. Also included in this new collection of documents are financial records of Rufus Johnston, including receipts, bonds, and bills of payment. We also received correspondence and letters from Mary Gibson, one of which tells her brother Robert what she would like done with her property towards the end of the Civil War. Another folder contains a few documents about Davidson College itself. One document was written by Reverend Jethro Rumple, reminiscing about life at the college in the 1840’s. Included is a small handwritten biography by Reverend Rumple about Reverend John Bunyan Shearer, the eighth president of Davidson College from 1888 to 1901. These documents help give us all a greater idea of what living as a student in those times was like. Also included in this batch is a letter written by Rumple to Brother McLaughlin about an 1878 Concord Presbytery Meeting in Statesville, North Carolina. This collection also includes various reports to and about Presbyterian Churches across the state. A few letters are addressed to synods, while others are reports on new developments within the church. There are also several notebooks, copybooks, and ledgers used by the church. An 1855 receipt from Rural Hill Plantation promising payment of $50.12 due the next day. Finally, DigitalNC also received folders of papers and documents about several Mecklenburg County plantations. Stretching from the 1820s to the 1860s, many of the folders contain financial records and receipts from Rural Hill, a plantation in Huntersville that was built in 1788 by Major John Davidson. There are also documents from his grandson, Adam Brevard Davidson, who later became a Trustee of Davidson College, and financial records, ledgers and booklets from the Mt. Tirzah Plantation in Lincoln County. To browse through these materials, feel free to visit Davidson College’s partner page, or check out their website.